BROTHERS Lyman and Milton Stewart (1838-1923 and 1840-1923) were Pennsylvanian Presbyterians. They were also wealthy oil magnates, first in their home state and later in California. They were conservative evangelical Christians and they provided finance for a number of Christian fundamentalist initiatives, including the influential Bible Institute of Los Angeles started in 1907. In 1909, as "two Christian laymen", they anonymously pledged $200,000 from interest on securities investments, to underwrite the publication and free distribution of a set of twelve paperbacks. These appeared under the title The Fundamentals, a Testimony to the Truth. They signalled, according to historian George Marsden, "the rise of organised fundamentalism". The twelve volumes were published between 1910 and 1915 and were sent to "every pastor, evangelist, missionary, theological student, Sunday School superintendent, YMCA and YWCA secretary in the English speaking world" as long as funds would allow. Over three million eventually went out. Oversight of the selection of articles for these works was in the hands of a committee led, at first, by Amzi C Dixon. When Dixon moved from his Chicago pastorate to London he was succeeded briefly by Louis Meyer and then by R A Torrey. Dixon was a Baptist minister, Torrey was a pastor, evangelist and, at different times, leader of BIOLA and of Moody Bible Institute. Many involved in the project were, like these men, not only anti-modernist but Dispensationalist in their theology. The Scofield Reference Bible appeared in 1909 and it was this particular eschatological view that held sway in the thinking of many contributors. It is no surprise to find among the contributors names such as those of Arno Gaebelein, C I Scofield himself and W H Griffith Thomas (a co-founder of Dallas Theological Seminary). However, a much broader spectrum is represented than the narrower one of Pre-millennial Dispensationalism. For example, it goes right back to Thomas Boston (1676-1732) for an essay on the nature of regeneration and to J C Ryle, who died in 1900, for one on The True Church. Calvinists James Orr (three essays) and B B Warfield (one on Christ's deity) also contributed. On the other hand, E Y Mullins was very much a moderate in his approach to the modernist question and G F Knight sought to reconcile evolution and creation. The more than fifty contributors were mostly Americans. Contributors from this side of the Atlantic included G Campbell Morgan and Handley Moule, Bishop of Durham. One interesting piece of trivia is that at least four contributors had connections with Spurgeon's Tabernacle in London. T W Medhurst was Spurgeon's first ministerial student. An essay of his on Romanism is included. American A T Pierson, who pastored the Tabernacle congregation from 1891, the time of Spurgeon's final illness, contributed a number of articles. Pierson started as a Presbyterian but became convinced of the Baptist position. Despite this he was succeeded in 1894 by Spurgeon's son, Thomas. He wrote for The Fundamentals on Salvation by Grace. He served at the Tabernacle until 1908 when Archibald G Brown came in. It was A C Dixon's call to leave the Moody Church in Chicago for the Tabernacle in 1911 that forced him to withdraw from the production of succeeding volumes of The Fundamentals. There were originally over eighty articles. The series begins with a history of higher criticism and goes on to defend the Bible from the various attacks that have been made on it, especially on the Old Testament text. Next come essays on the inspiration of Scripture, then basic doctrines such as Christ's person and work, the Holy Spirit, atonement, grace, regeneration and justification. Later volumes deal with practical matters such as preaching, evangelism, mission, consecration, Romanism and other false teachings, prayer, money and Bible study. The set ends not only with eschatology but also with Christian testimonies. In 1917 a slightly abridged four volume edition of the work also appeared. By this time the funding for free distribution was exhausted yet requests for the books continued to come in, Therefore this new edition was sold at as low a price as possible. The preface was written by R A Torrey and there was a dedication to the, still then anonymous, Stewart brothers. Reprints have continued and in 1958 an updated edition The fundamentals for today also appeared, edited by Dr Charles L Feinberg of Talbot Theological Seminary. 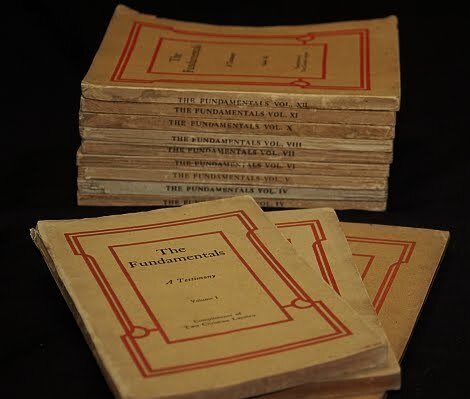 The term fundamentalist was probably coined in 1920 when Curtis Lee Laws, editor of the Watchman-Examiner used it to describe those present at the first "fundamentals" conference, prior to the Northern Baptist Convention. He spoke of those were ready to do "Battle Royal for the fundamentals". The influence of the little paperbacks on his choice of words cannot be overlooked , More than that, these little books must have made an immense influence on many who were struggling to come to terms with the issues involved in the great battle between modernism and fundamentalism in the early part of the 20th century, not just in America but further afield as well . There is reason to be thankful to God for the vision and generosity of all those involved in this important project.